For over 50 years, JELD-WEN has inspired people to build the best, be the best, and do the best. From small town Oregon millwork operation to leading global window and door producer, JELD-WEN has remained committed to raising industry standards through service, product quality, education, and community. Since 2016, AXIS has worked with JELD-WEN on a variety of retail programs (see another here). To complement these efforts, AXIS was asked to participate in the design and development of the company’s new HQ and flagship showroom. Located near Charlotte, NC, the multi-faceted structure serves many purposes. Traditional offices, meeting and conference rooms, classrooms, and a state-of-the-art training facility occupy a 120,000 sq. ft. building. 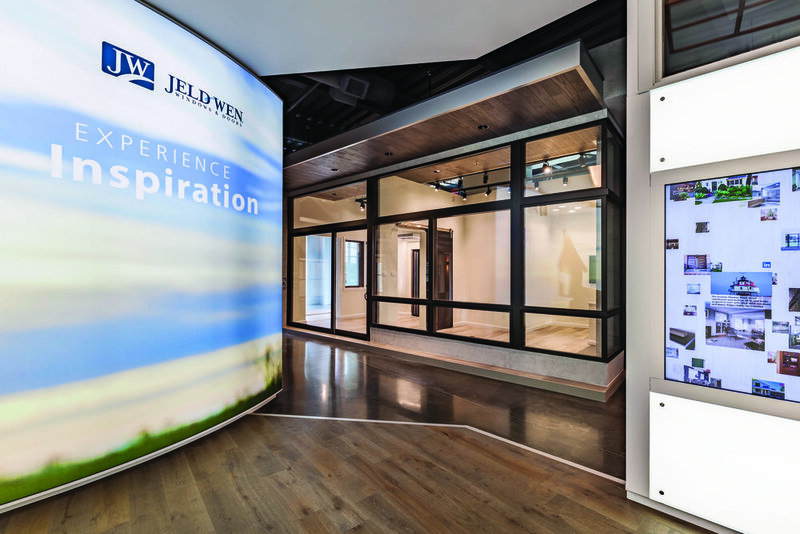 About 40% of the first floor contains an interactive showroom featuring JELD-WEN products, vignettes, a gallery, and more. The project was designed to cater to many audiences. 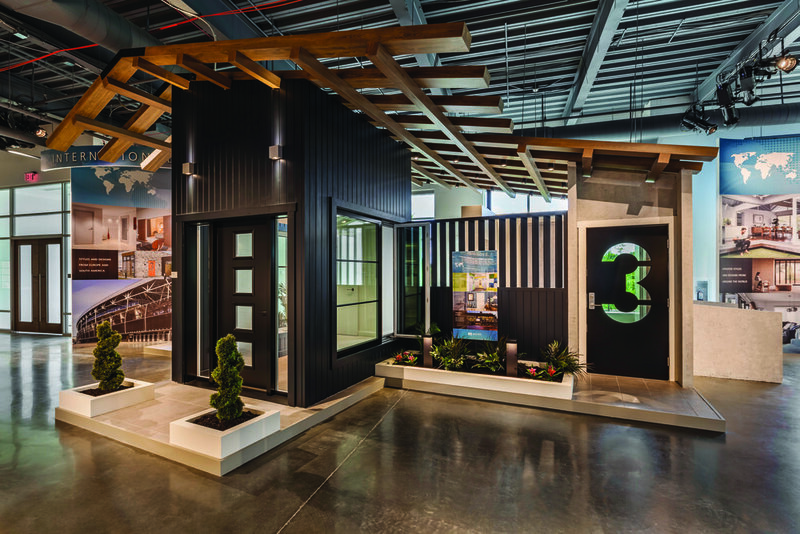 It now serves as a communal inspiration hub, offering JELD-WEN employees, ambassadors, investors, dealers, architects, designers, builders/general contractors, and homeowners the ability to interact and bring projects to life under one roof. Additionally, the space showcases products from JELD-WEN’s many global brands. Before embarking on the design of this project, one thing was clear: this was not to be a typical showroom. JELD-WEN intended the space to be a place where its brand purpose - “to bring beauty and security to the spaces that touch our lives” - could be brought to life in real-time through the use of storytelling, interactive visualization, and unprecedented customer service. This space offers visitors a welcoming and entertaining introduction to the JELD-WEN story. 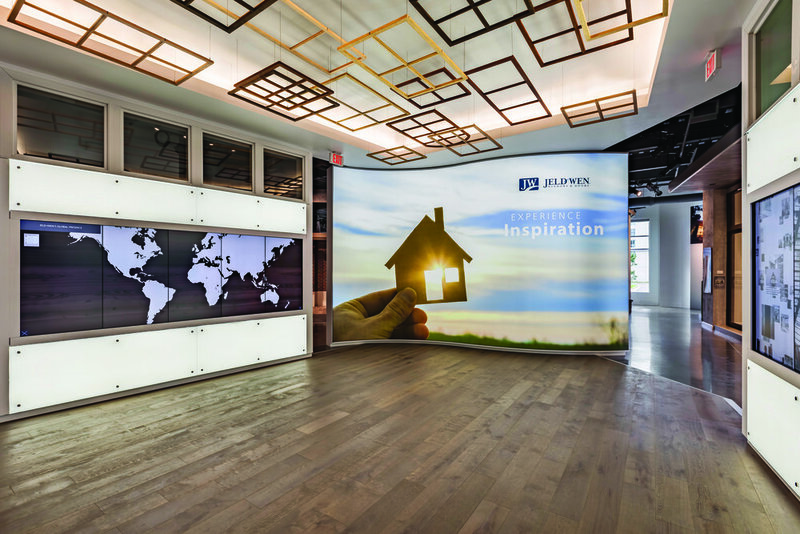 Beyond traditional reception area features, this space takes visitors on an interactive journey through JELD-WEN’s foundation, community impact, global expansion, products, recent projects, and more. 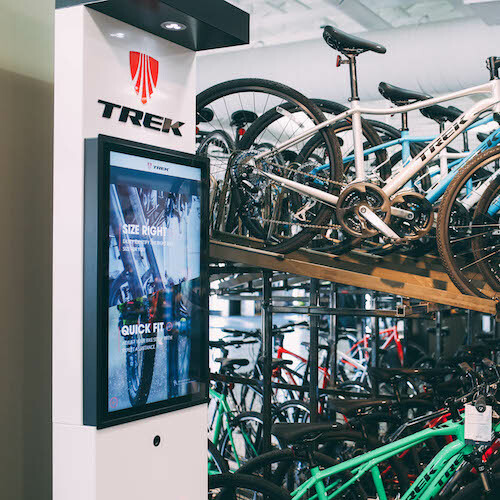 Bonus: To foster a user-defined experience, when individuals arrive to the space, they are given a handheld interactive tablet loaded with AR technology. The tablet guides them through the showroom experience, keeps record of what they interacted with, and stores any product selections made. 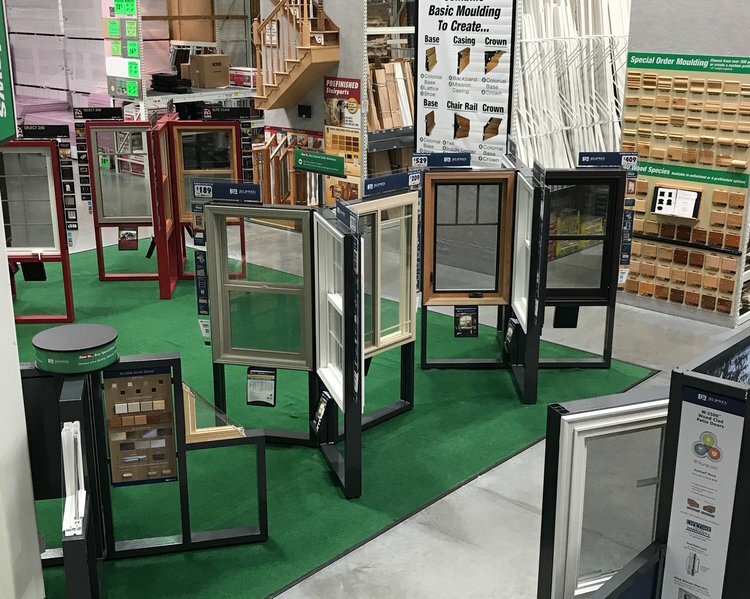 Users are able to view selected JELD-WEN products, change finishes and styles, create a “favorites” list, take photos, and email their selections. Depending on the individual’s need, this information can be used on-scene with a JELD-WEN design consultant in a conference room or can be stored and reviewed later via email or customer profile. Data collected from this experience is also gathered and used for marketing purposes. 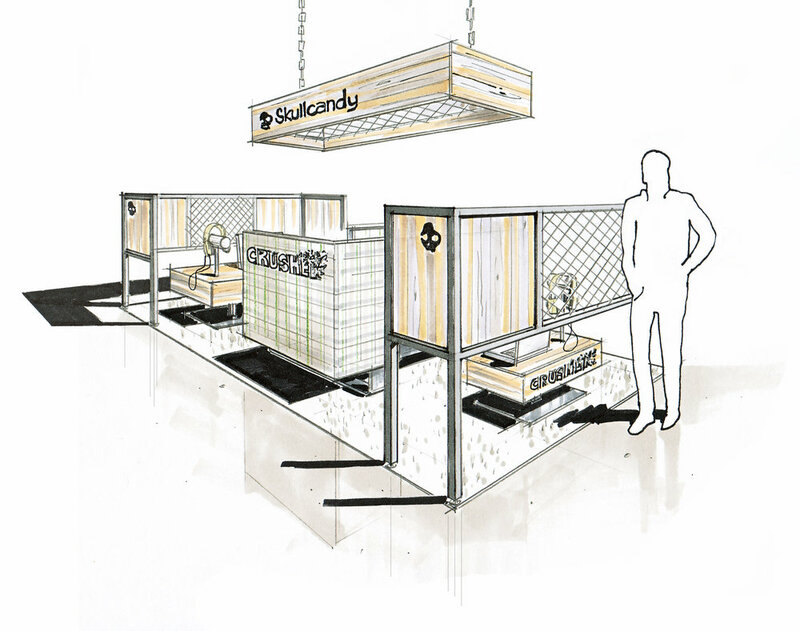 AXIS created five vignettes which allow shoppers to stroll through the many facets of the brand. 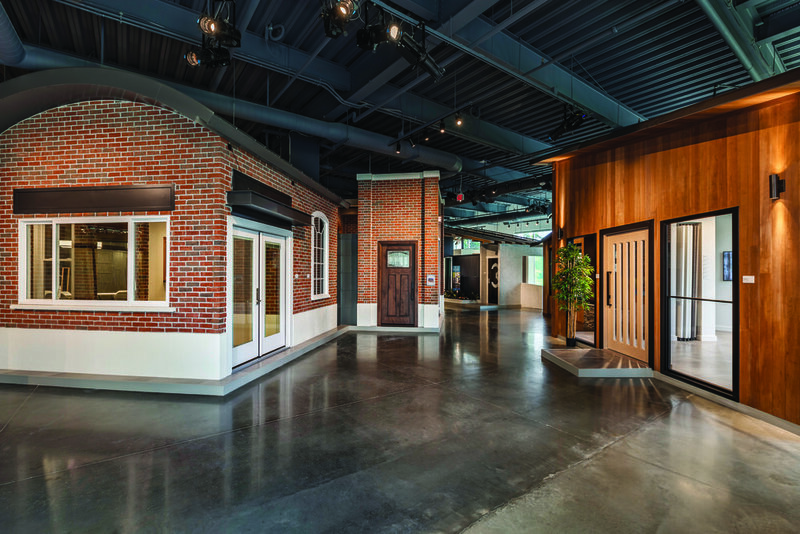 To organize the wide selection of national and international brands and product lines, this section of the showroom was designed as a “village,” a tour de JELD-WEN, if you will. Most vignettes incorporate some sort of interactive technology, often enhanced by the tablets visitors are given upon entry; however, the space was designed to be functional without the use of technology should that be a visitor’s preference. Staged product demonstrations and various visualization assists (such as touch screen monitors with finish options) are present in the vignettes, helping visitors see their ideas come to life within the vignette space. Tactile exploration of products, finishes, and options are available as well. Additionally, lifestyle graphics and imagery perpetuate the concept of building a JELD-WEN home, not just using windows and doors. Incorporating all of these elements makes the space adaptable to any audience and promotes multiple ways to absorb information, engage the senses, and experience the products. Vignette 1 is a contemporary design utilizing architecture and materials best demonstrating JELD-WEN’s contemporary products. Deep rich wood tones accented by metal cladding allow the product to be cast in its natural element. Vignette 2 showcases JELD-WEN’s more traditional products in a modern farmhouse style setting. Painted batten and board siding is accented by white trim. Painted metal roof ties the entire design together. Vignette 3 is the global space which demonstrates a wide variety of product styles. The overall aesthetic was intentionally designed to allow the mix of product to work independently from the space. Vignette 4 was designated for the JELD-WEN’s Australian brands. The architecture and cherry wood exterior are indicative of residential structures found in that geographic region. Vignette 5 is a mixed use area highlighting products most used in commercial and renovation-type projects. The design intent was to utilize a weathered brick facade to give the appearance of a newly renovated commercial and/ or multi-family building. In addition to the weathered brick, dark steel and concrete elements tie into the design style and set the tone for the product mix. This creative, co-inventive branded workspace was built to help trade professionals (builders, architects) and their clients further review, examine, and compare specific product selections. Through our research, it was identified that there is a communication gap between the designer/ architect and the homeowner. This space was intended to streamline project communication, project planning, and product selection in a dedicated, private space. Whether the visitor’s journey began in the showroom or online, this space is where options become decisions. 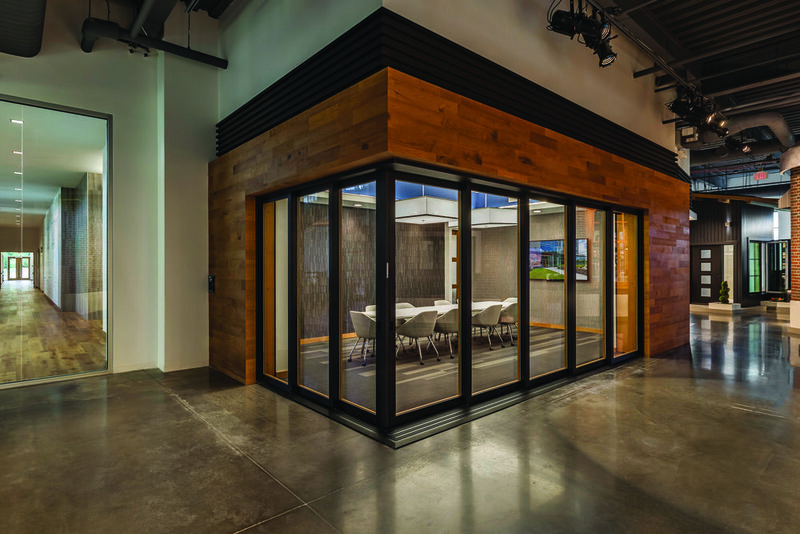 This multi-faceted section of the showroom provides a forum for members of any JELD-WEN audience to learn more about the brand, the products, and the company’s commitment to continuous improvement. It serves as a place for trade professionals, dealers, and ambassadors to receive ongoing training on installation and maintenance demos, as well as information of quality standards, new product rollouts, and global initiatives. Additionally, homeowners can learn about cost, compare options, and make purchasing decisions in a private, focused environment directly with a JELD-WEN employee. Building Architect: LS3P Associates, Ltd.